FIVE schools in County Down have been selected to receive life-saving defibrillators as part of the 2013 World Police and Fire Games (WPFG) legacy. 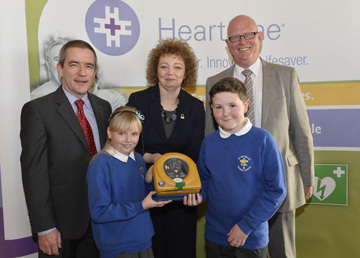 Sports Minister Carál Ni Chuilín and Declan O’Mahoney, Chief Executive of defibrillator manufacturer, HeartSine Technologies pictured with Ella Denver and Shea Dorian with St Nicholas’ Primary School principal Eamon Fitzsimons. 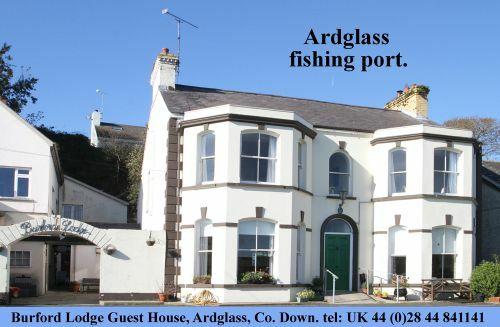 Saint Nicholas Primary School in Ardglass, St. Macartan’s Primary School in Downpatrick, Blackwater Integrated College in Downpatrick, St. Patrick’s Primary School in Saul and Grange Primary School in Kilkeel, were amongst those deemed to have submitted the best entries explaining why they should receive one of the 45 Automated External Defibrillators (AED’s) originally stationed at this year’s Games. 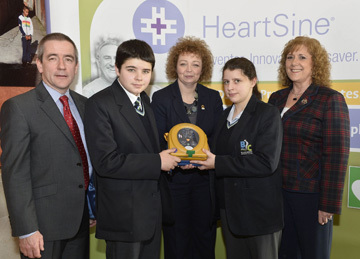 The devices, manufactured by Belfast company HeartSine Technologies, were presented to representatives from the selected schools by Sports Minister Carál Ni Chuilín at a special ceremony held at Stormont. Speaking at the presentation of the defibrillators, Minister Ní Chuilín said: “The World Police and Fire Games were a landmark event, which saw 7000 competitors from 67 countries competing in 56 sports. Add to this the tens of thousands of spectators, 3,500 volunteers and numerous support staff and you have a sporting celebration on a grand scale. “After the event, the focus turns to the legacy and how we can use the momentum of the Games to make a positive impact on people’s lives – particularly in areas of deprivation and social exclusion. Blackwater College pupils Gemma and David Ellison with principal Dr Olwyn Griffith at the presentation at Stormont. “That is why I welcome this initiative, which sees a potentially lifesaving piece of equipment given to schools. It is a positive development for those at the schools, and their wider communities. “I would like to thank HeartSine Technologies, who manufactured the defibrillators, for their support during the Games, and for this important contribution to the legacy. Seamus Murray, Director of Business Services at 2013 WPFG Ltd. said: “In August we celebrated the Games and its success, today we are able to continue that success through our legacy work with one of our key sponsors, Heartsine. St Patrick’s PS pupils from Saul Caitlin Burke and Sean Fitzsimons with teacher Susan Sealey receive their defibrillator. 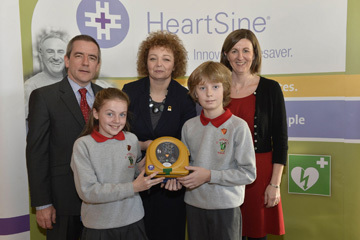 The judging panel was made up of representatives from HeartSine, WPFG and the Red Cross, which will provide free AED training in 2014 to all schools selected to receive a defibrillator. Principal of Blackwater Integrated College, Dr Olwen Griffith, also commented saying: “We are delighted to receive this as it has the potential to save lives in our College, and across the local community. 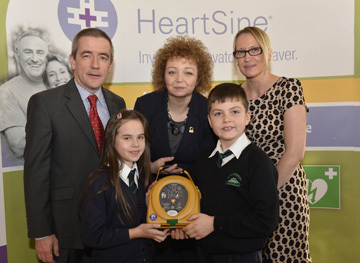 Declan O’Mahoney, Chief Executive of defibrillator manufacturer HeartSine Technologies and Sports Minister Carál Ni Chuilín with St Macartan’s PS pupils from Loughinisland Lauren Gregg and Jimmy McLeigh and teacher Angela Murray. “We at the College have always been pro-active in looking after the health of our staff and pupils, and this defibrillator is a further indication of our commitment to the wellbeing of our community. And the Principal of St. Patrick’s Primary School in Saul, Mark McGrath, said: “Being successful in this campaign will have such a benefit for not only our school, but the surrounding community of Saul & Raholp. Declan O’Mahoney, Chief Executive of HeartSine Technologies, who are the only company to design, develop and manufacture AED’s in the UK or Ireland, also said: “We were delighted to initially provide 45 defibrillators to the Games venues, and even more delighted to have been involved with such a fantastic legacy programme which has allowed us to distribute our lifesaving devices to a number of schools within each of Northern Ireland’s five Education and Library Boards. “I would like to thank all of the schools who took the time to support this initiative because in backing this campaign and getting an AED, the schools are supporting their local community who will have access to the defibrillator as well. “Around 270 people die from Sudden Cardiac Arrest (SCA) every single day in the UK. “If someone suffers SCA and is treated with Cardiopulmonary Resuscitation (CPR) alone, survival rates are less than 5%. HeartSine AEDs, which are manufactured in over 29 languages, are in place in public buildings, schools and sporting arenas across the world including The White House, European Parliament Buildings, Stormont Parliament Buildings and at George Best Belfast City Airport. Key facts to know about the defibrillator and heart attacks. * The process emergency departments use to treat cardiac arrest is known as ‘The Belfast Protocol’ as the world’s first out-of-hospital defibrillator was developed in Belfast in the 1960’s. * The chances of surviving Sudden Cardiac Arrest (SCA) decrease by 10% for every minute a defibrillation ‘shock’ is delayed. * With CPR alone survival rates after an SCA are less than 5%, when CPR is combined with the use of a defibrillator, survival rates increase to over 70%. * 84% of SCAs occur away from a healthcare setting.